The national seismic hazard maps for the conterminous United States have been updated to account for new methods, models, and data that have been obtained since the 2008 maps were released (Petersen and others, 2008). The input models are improved from those implemented in 2008 by using new ground motion models that have incorporated about twice as many earthquake strong ground shaking data and by incorporating many additional scientific studies that indicate broader ranges of earthquake source and ground motion models. These time-independent maps are shown for 2-percent and 10-percent probability of exceedance in 50 years for peak horizontal ground acceleration as well as 5-hertz and 1-hertz spectral accelerations with 5-percent damping on a uniform firm rock site condition (760 meters per second shear wave velocity in the upper 30 m, VS30). 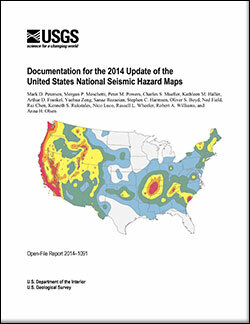 In this report, the 2014 updated maps are compared with the 2008 version of the maps and indicate changes of plus or minus 20 percent over wide areas, with larger changes locally, caused by the modifications to the seismic source and ground motion inputs. Petersen, M.D., Moschetti, M.P., Powers, P.M., Mueller, C.S., Haller, K.M., Frankel, A.D., Zeng, Yuehua, Rezaeian, Sanaz, Harmsen, S.C., Boyd, O.S., Field, Ned, Chen, Rui, Rukstales, K.S., Luco, Nico, Wheeler, R.L., Williams, R.A., and Olsen, A.H., 2014, Documentation for the 2014 update of the United States national seismic hazard maps: U.S. Geological Survey Open-File Report 2014–1091, 243 p., https://dx.doi.org/10.3133/ofr20141091.